185 Oktoberfests! I haven’t been 184 times but I have been nearly 15 times over a 10 year period. 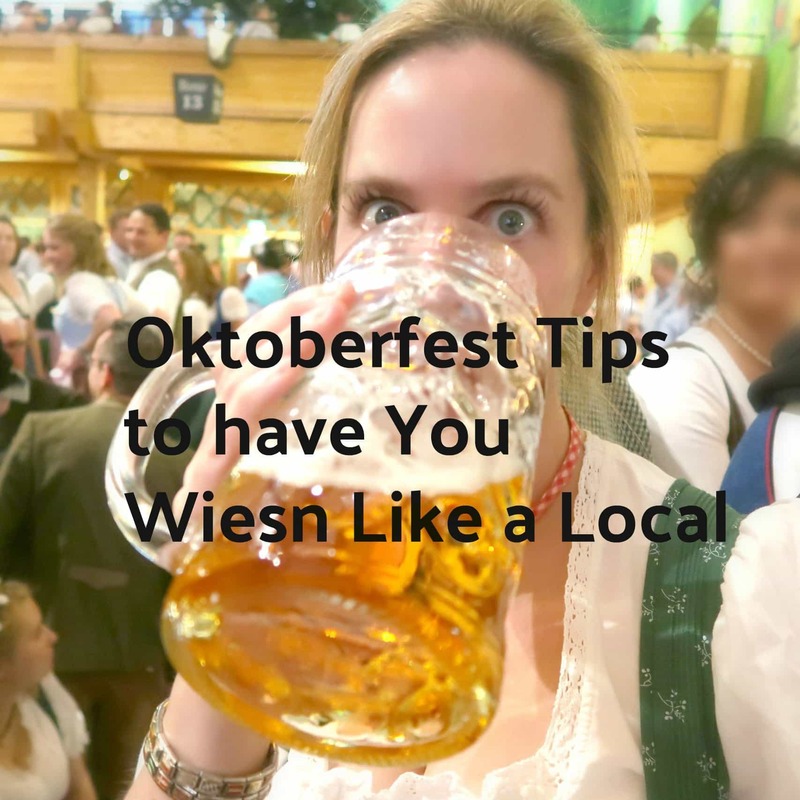 The following post gives some Oktoberfest tips to have you Wiesn like a local!! Oktoberfest 2018 will mark the 185th celebration since 1810. 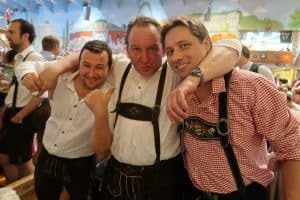 Marrying a Bavarian quickly taught me the depth of which some Bayern truly love Wiesn aka Oktoberfest. 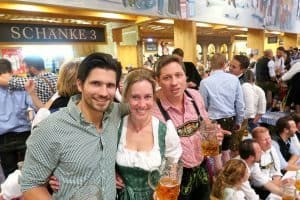 When dating, I was excited to attend Oktoberfest with locals. 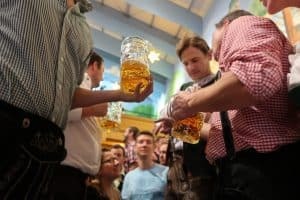 Once we were married and used part of our honeymoon time, shortening our trip to Greece and Turkey to return back to Germany for Oktoberfest, I saw just how deep a Bavarian’s love runs for Oktoberfest. Oktoberfest begins in September and ends on the first Sunday in October or on October 3, whatever is later. One of the largest festivals in the world Oktoberfest began in 1810 as a wedding celebration. Crown Prince Ludwig I married Princess Therese of Saxe-Hildburghausen and their wedding took place on the Theresienwiese. Oktoberfest has taken place almost every year * since to commemorate this event. * Due to war and illnesses and such, this list shows the years and reasons that Oktoberfest was canceled. My husband with good friends!! The Wiesn is a warm-hearted celebration serving Bavaria’s finest seasonal beers for at least 16 days of nonstop drinking. For Bavarians, it’s tradition and has a greater depth of meaning beyond good beer to drink. 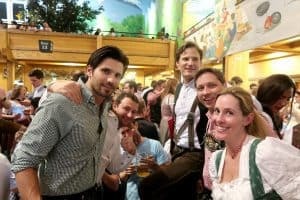 To truly partake properly in Bavaria’s Wiesn, global and German visitors can take a few steps to embrace cultural differences and fit in with the locals. Wiesn fun with husband, Brother-in-law, cousin, and friends at our table! 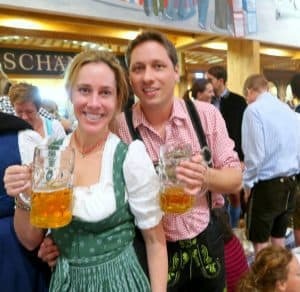 Before I attended my first Oktoberfest, my husband gave me a CD with all the Oktoberfest music on it and sheets of paper with the words to all the songs. Yes, there are songs in English and songs that are globally well-known by nearly every living person. However, to be able to sing along with the locals to some of their special Eurovision, Schlager, or general popular songs will not only gain you respect amongst others at your table but it is just fun. I was living in Mainz in 2006 and the song, Cowboy und Indianer became popular that year. It’s played at Oktoberfest every year now. It’s fun to sing along with all the Germans and Bavarians while also doing the hand motions to the song. There are also some Bavarian songs that Germans might need to practice. Click here for a link to listen to list of songs played at Oktoberfest. Singing along to the songs….a must for most fun! “Wiesn” (Bavarian word for “Wiese” and a synonym for Oktoberfest) Basically, “Wiesn” it’s what all the locals call Oktoberfest. “Theresienwiese” which translates to mean a meadow or grassland of Therese and is referring to the area in which Oktoberfest takes place. Theresienwiese is a flat area, 420,000 square meters (4,500,000 sq ft), in the Munich quarter of Ludwigsvorstadt-Isarvorstadt. The Bavarian statue and the neo-gothic St. Paul’s Church are two additional points of interest for viewing on the Theresienwiese grounds. You have to be sitting at a table if you want to be served a beer. You’ll want to be able to order a beer. Ask, “A Maß, bitte” and you will be served a litre(liter) of beer. Practice saying this because it is said often! And before you take a sip of that beer after saying “Oans, zwoa, drei, g’suffa” make sure you chink glasses with everyone at your table while also looking them in the eyes. “Brezel” is German and “Brezn” is Bavarian. Ordering a Brezn is a must when visiting Bavaria and Wiesn. In my opinion, this is one of the best food items to snack on while drinking and dancing in the tents!! “Brathendl” Also known as “Grillhänchen” in other parts of Germany, or “Wiesnhendl” is a must order when visiting Germany anywhere. Delicious! They serve them hot and fresh at the Wiesn. “Wiesnhendl” is by far the most popular food ordered at Oktoberfest, not sausages. * When people pre-reserve a table at the Wiesn, weeks in advance, they are given 2 coupons for a Maß Bier and one coupon for a Hendl. The combination of a Brezn with a Hendl at the Wiesn the perfect combination of yum and hardy. “Weißwürste” (white sausage in German and Bavarians say “Weißwuascht”) This is a traditional Bavarian sausage made from minced veal and pork back bacon with some variations of flavor such as parsley, lemon, onions, and ginger. To stay with tradition, Weißwuascht should only be consumed before noon time and one should bite the top of the sausage and then “zuzeln” or peel off the skin and cut into small bites. When you are leaving Oktoberfest or finished with Oktoberfest you can say, Pfiats Eich. The mayor taps the ceremonial keg and opens Oktoberfest at the stroke of noon on the first day. In German, “It’s tapped” would be “Es ist angezapft” but “O’zapft is” is Bavarian. And the mayor says “O’zapft is! Auf eine friedliche Wiesn” when he taps the first keg. I have only watched this on TV with my husband not once, but nearly every year when it happens!!! It’s also shown on the national news! 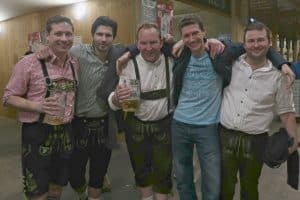 For more Bavarian references with words and phrases just for Wiesn/Oktoberfest: This is an excellent link, Wiesn Vocabulary!!! Hilarious really!!! 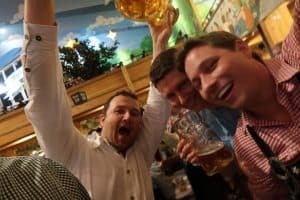 Oktoberfest Tips to have You Wiesn Like a Local! Have you been to the Wiesn in Munich? What tips would you add to this post? This sounds like tons of fun! Thanks for sharing the lingo, so we don’t feel as lost! Thanks for the feedback Melanie! Knowing what to expect always helps with the experience! You’ve been 15 times, wow! I’d love to head over to Munich one day for Oktoberfest. Looks like so much fun and the food sounds amazing! Thanks for the feedback Kalena! The food is amazing especially when you are in a tent drinking all day! !